Kes is being tutored by Tuvok in her mental abilities and it seems Kes is a little impatient and when she arrives late for her duties in sickbay the Doctor isn't pleased with her. They are distracted by a resonance coming from a storage closet and inside are the remains of the caretaker and we are reminded that another of his species is somewhere in the galaxy. Voyager attempts to track the energy signature to it's source and eventually finds a space station modelled on the caretaker's Array but when they approach they are fired upon and then warned to stay away. Kes is informed that there are Ocampa on the station and their leader Tanis agrees to come to Voyager after seeing Kes on the bridge. It turns out that they have heard Voyager was a "death ship" and has raided planets, waged war against the Kazon and killed the first caretaker but Kes seems to sway Tanis towards the truth and he opens up to her about the Ocampa and their extended lifespan and mental powers. Tanis tells them that in time they will meet the caretakers companion "Suspiria" but in the meantime he teaches Kes some mental exercises with some mixed results and less than ethical intent. Tanis continues to drive Kes in her embrace of the enhanced mental abilities despite almost killing Tuvok when she was showing off her new skills but eventually Tanis gives Voyager the coordinates of an area of space where Suspiria will meet them. It is perhaps fortunate that Tuvok has been working on a way to nullify and contain the being if she posed a threat because when she eventually turns up it goes poorly. It's not surprise given that she believes the same as the Ocampa that Voyager killed the caretaker who was her mate but after she is contained Janeway releases her and Suspiria leaves the ship intact and takes Tanis with her. The episode closes with Tuvok and Kes once again discussing her abilities and his wish to continue to instruct her. Cold Fire didn't really do a lot for me, I wasn't never that invested in Kes and as it came to pass neither were the writers and producers but it's not that bad an episode and it did give us some possible avenues to explore as Kes matured and her abilities grew. A few issues with the episode, the exposition at the beginning was a little much and where were the privacy issues when training a telepath, pretty sure Tuvok should have addressed the inappropriately in listening in to someone else's thoughts. The Doctor seemed a little jealous of the time Kes was spending with Tuvok, that was interesting or maybe it was just the more cantankerous character of the Doctor in the early seasons. I'm not sure Voyager was even attempting to approach Suspiria in good faith, oh no we didn't kill your mate but we just have weapons and containment tech if you so much as flinch. The mental powers of the Ocampa were impressive although a little too powerful as it seemed more Q like to cause vegetation to bloom just like that. 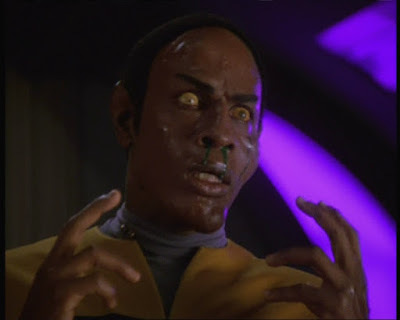 So we know modern Federation medical science is very advanced and that Vulcan's are tough nuts but no way Tuvok should have survived the rapid rise in internal temperature nor after that regaining his outward appearance, totally took me out of the narrative they were trying to create. I did like the idea (if that was the intent) of the Ocampa being Space Vampires draining the lifeforce from other sources to fuel their manipulations and well throw out the ethics and morals of how you deal with other lifeforms then there are no limits, come to the dark side young one! Suspiria finally turning up and presenting herself as a young female, clever manipulation but she didn't need that edge it only provided Janeway with the option to capture her, didn't like the writing for that nor how quickly this uber powerful alien just left and life went on as if nothing happened. 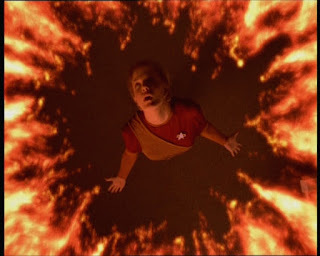 Cold Fire at best is an average episode, it didn't really do enough to flesh out Kes or at least it didn't lead to her character having more growth and that was certainly not Jennifer Lien's fault and is too often the ship sails on with little consequence.